Power Tools UK Reviews » Bench Grinder Reviews in the UK: Which is the Best Bench Grinder? Bench Grinder Reviews in the UK: Which is the Best Bench Grinder? 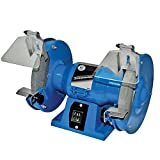 Bench grinders are one of our favourite power tools as they are useful machines that can be used for grinding, polishing, and linishing (or belt sanding), and at the same time they are relatively simple machines which makes picking the best bench grinder for one’s workshop an easy process. Essentially, once you have decided on the grinding wheel diameter to go for, usually either 6″ (150mm) or 8″ (200mm), it simply then becomes a matter of buying the highest powered machine that you can afford, while keeping an eye out for the features that each offers. What’s good about bench grinders is the ability to change out the wheels for different types of grinding wheels, wire wheels, or polishing mops, endowing the humble bench grinder with a whole range of capabilities. In this look at bench grinders, we first examine the features to look out for when choosing a machine for your workshop before analysing individual bench grinders that are available in the UK in our more detailed bench grinder reviews further down the page. So what size to get? After deciding on whether the bench grinder size will fit in the workshop space allocated for it, choosing which size is best is to some extent a matter of personal preference. The size of the wheel does affect some characteristics of the bench grinder, like a larger wheel has a faster angular velocity at the grinding edge affecting the rate of frictional heating, or smaller wheels are more curved at the grinding point which can cause slight differences in bevel formation, however, for the most part, the effect on actual function is minor. Power – This is probably the most important parameter to consider when buying a bench grinder. Power is given in Watts which best indicates how tough a material can be used on the bench grinder and how quickly material can be removed from the subject being grinded. The harder the material being grinded and the faster it needs to be removed, the higher the pressure needed on the grinding surface. If the machine is insufficiently powered, pressing too hard on the grinding surface will begin to slow the wheel down (or even stop it altogether), making the work of grinding tedious and difficult. In the case of polishing with a wire wheel or a mop, a powerful motor in the bench grinder is even more important and most low power (eg. 150W) budget machines will not be able to be used effectively as a polisher at all. Wheel bore size – The wheel bore size only becomes relevant when you want to change the wheels to ones of different coarseness or to different wheel types. In such cases it is important to know the wheel bore size so appropriate sized replacements can be purchased that will fit. Noise – The more powerful the bench grinder and the less well built it is, the more vibration and noise it will generate. In general however, bench grinders are relatively quiet compared to most other power tools! Cheap and cheerful is the Silverline Silverstorm 263511 bench grinder. Don’t expect too much from this machine for such a low price. This is a light grinder only as it only has a small 150W motor, ideally designed for sharpening knives, chisels, and the like. Build quality is on the low side, and you cannot apply too much pressure to the grinding wheel otherwise it slows down or even stops. This bench grinder can not be used as a polisher, so if you are thinking of attaching other wheels to it, like a wire wheel, then forget it, it will not do a very good job of polishing. One other thing to remember with the 263511 is that the machine starts to warm up after 10-15mins of grinding and should not be used for more than 30 minutes at a time without allowing it to cool down, otherwise the motor will not last very long. It is reasonably quiet, but vibrates a little bit so it does need to be bolted down to the workbench. The Silverstorm 263524 is the next step up in the Silverline Bench Grinder tool range after the 263511. It has a slightly more powerful 200W motor, but exhibits many of the same characteristics as the 263511. The 263524 runs smooth and the wheels run true as long as they have been checked for adjustment before starting it up for the first time, making the machine operationally quiet with little vibration. However, the 263524 comes with many of the same niggles that its smaller sibling comes with, namely, the motor is not excessively powerful which means any significant pressure on the wheel will slow rotation. In addition, the motor heats up after several minutes of use requiring periods of downtime to let it cool. Furthermore, the instruction manuals are very limited and a lot of guesswork is required just to set up the grinder, although common sense makes it not terribly difficult to do so. Some of the parts that bolt onto the grinder like the tool rests, the eye guards and spark protectors are very flimsy. In addition, due to the overall physical size and design of the machines, one has to be careful not to ‘bump’ into the adjacent turning wheel when grinding a long tool at an angle. 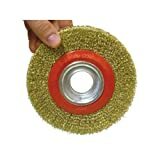 The grinding wheels that come with both machines are the same 36 and 60 grit discs, which many will find are a bit too coarse for sharpening more delicate blades and tools. With the bigger 263524 which has a proportionally bigger sized motor, one also has the added problem of the motor housing being directly over the bench-mounting holes making it more difficult to bolt down the machine to the bench. As for the Silverline Tools company, most DIY-ers have heard of the brand which covers a vast range of different tools that are very economically-priced. Some tools are exceptional value for money, but others can be pretty poor. Silverline usually offers a 3-year warranty on their products but don’t rely on this too much since the return postage is the responsibility of the owner, and since the price of their tools are usually so low to begin with, most people find that it is just not worth the effort of returning a faulty tool. Like the FERM BGM1019 bench grinder discussed elsewhere on this page, the Einhell TH-BG150 is a notch above the cheapest bench grinder you can get in this bench grinder category. For that you get a well-built unit that exhibits very little vibration and emits minimal sound. Once again, with its 150W motor, it is not excessively powerful so harder material grinding will be a challenge for it but for most DIY / hobbyist work, such as sharpening or shaping metal, it will be more than sufficient. It uses standard 150mm discs and so the grinding wheels that come with it can easily be replaced by a polishing or wire wheel although once again, like other 150W bench grinders, the Einhell bench grinder can only be used as a polisher for very light polishing work. The unit sits on 4 rubber feet with holes in them that are good for bolting down the bench grinder to the worktop. Although it is not necessary to do so with the Einhell TH-BG150 since it has very little vibration, it is always recommended to securely fix a bench grinder to the benchtop in the interests of safety. Einhell is a less-well known German company which produces a range of tools for both the DIY-er and the trade professional. Their tools are usually not the cheapest but are reasonably priced and are usually very good value-for-money. Owners of Einhell tools are usually completely satisfied with their performance. Pay a little more than what you pay for the cheapest bench grinders and you get a better built unit. That’s the case with the FERM BGM1019 which is very quiet and has almost no vibration to the point that it does not move around the bench-top if it is not bolted down, although this is not recommended with any bench grinder. Like the cheapest bench ginders, the FERM BGM1019 still has a relatively low powered 150W motor that will not tackle the tougher materials and is not ideal for polishing jobs. It is ideally suited to sharpening tools and blades, although some owners have changed the wheels for polishing wheels which they have used to buff up some of their lacklustre personal possessions. As with other 150W motor bench grinders, the motor tends to become hot after 10-15 minutes of use and should not be used for more than 30 minutes in any one stretch without giving it some time to cool down. FERM is not very well-known in the UK but it is a reputable dutch company that sells a wide range of tools (including bench grinders) to an international base of customers, and owners of FERM tools are usually surprised how good their tools are! The Clarke CBG6RP 6-inch bench grinder is another member of the budget category of bench grinders designed for the at-home DIYer. It is a generic type of machine that has been manufactured in the Far East and then badged with the Clarke logo and branding. 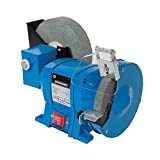 It has a 150W motor which is one of the less powerful motors that one gets in the 6-inch bench grinder lineup and as such, like the other 150W bench grinders on the UK market, the Clarke machine is really only designed for light metal grinding of small hand tools such as chisels and the like. Grinding on the Clarke machine is carried out using the 20mm-width coarse and fine grinding wheels that come with it. However, for full sharpening of tools as well as blades, a yet finer grit wheel is recommended or a manual whetstone should be used after the initial dressing on the default Clarke grinding wheels. The Clarke bench grinder uses a standard 12.7mm bore size so replacement wheels should be easy to come by. As for other types of activities that can be undertaken on the bench grinder, the Clarke CBG6RP machine is not powerful enough for regular polishing work but, at a stretch and if not too much pressure is applied on the wheel, can be used for some very light buffing when used with an appropriate polishing wheel. The Clarke CBG6RP 6-inch bench grinder is relatively heavy considering its motor size coming in at around 8kg which bodes well for greater stability on the bench top, but not so for moving it around a lot. 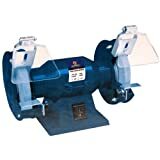 In fact as with most bench grinders, the Clarke machine should be bolted down to the bench top for maximum safety and in this regard there are four screw holes moulded into the base of the machine designed to permanently fix it into place. On the more negative side, although most of the motor housing on the Clarke bench grinder is made of metal, the base of the machine is made out of plastic which, although tough, would have been better if it too was made out of metal so as to increase long-term robustness. One other point to note with the Clarke machine is that the bench grinder is only designed to continuously operate for five minutes at a time before needing to cool off for five minutes. This can sometimes make use of the bench grinder inconvenient especially with prolonged grinding jobs. Clarke International is a UK company that has been around since the 1960s and supplies powered and unpowered DIY and home improvement tools to the UK consumer indirectly via a number of retail outlets. Although Clarke products are sourced mostly from abroad, they keep a sharp eye on quality. This means that Clarke tools are reasonably good tools that are priced competitively, and also means that literature accompanying its tools is accurate and written in good English. This is also true of the Clarke CBG6RP bench grinder. The Makita GB602 bench grinder is Makita Corporation’s contribution to the 6-inch bench grinder tool category and as expected from the Japanese company, the GB602 is a precision tool with grinding wheels that show little vibration and a motor that makes relatively little noise. The motor power in the Makita bench grinder is 250W, powering the grinding wheels to 2850 rpm, and making the GB602 effective at medium level grinding of larger tool blades and power tool bits. It is, however, not the most powerful 6-inch bench grinder on the market, and unsurprisingly, pressing too hard on the grinding wheels can slow or even stop their rotation. Fortunately, the slowing or stopping of the wheel rotation only occurs when excessive pressure is applied and is not really relevant to normal grinding practice. The Makita bench grinder accepts 150 mm grinding wheels up to a thickness of 20mm, however it should be noted that the grinding wheels that come with the bench grinder are only 16mm in thickness. Fortunately, upgrading the wheels if desired is a relatively simple process, and since the wheel bore size or spindle diameter on the GB602 is the standard 12.7 mm that one finds on most 6-inch bench grinders, alternative wheels should not be hard to come by. Structurally, the Makita bench grinder is a well built sturdy and stable machine as one would expect from a Makita power tool weighing in at about 9.2 kilograms. It also incorporates two recessed screw holes in its base that allow it to be bolted down to the work surface for even more stability. One notably nice feature about the Makita bench grinder is that the housing over each wheel contains an integrated light that lights up the grinding area. However, it should be noted that these lights only come on when the machine is in operation whereas ideally we would have liked to see them have a separate control switch so that they could remain permanently on if desired. Surprisingly for a Makita tool, there is the odd outstanding imperfection with the Makita GB602 bench grinder. One notable dislike is the magnifying lens found in one of the eye shields that is supposed to provide greater clarity in the grinding area but instead provides a less than perfect image that most users will prefer to do without. Almost as if to address this issue, Makita bundles in safety goggles as part of the bench grinder’s accessories making the eye shields a little redundant, and to some extent making up for the poor quality magnifying eye shield. Overall, the Makita GB602 bench grinder is a high quality power tool that runs smooth and quiet. It is powerful enough to handle most DIY grinding jobs and although it can be used with polishing or wire wheels, it will be a little bit on the deficient side for heavier polishing work. Makita tools tend to be more expensive than equivalent power tools from the majority of other brands, but in general, you get what you pay for with a higher quality tool, and that is indeed the case for the most part with GB602 bench grinder. The Draper 66804 bench grinder houses a 250W motor making it a more powerful grinder compared to the budget 150W models. Having said that however, it is still by no means industy level, and the Draper 66804 remains firmly in the DIY / hobbyist camp. The Draper 66804 can sharpen tools, knives and even large lawnmower blades, but it will struggle with some harder materials. In addition, the more powerful motor does not mean that it can be used longer than lower power bench grinders as the motor will heat up over the course of 15-30 minutes of use and will need to be allowed to cool down at frequent intervals if the motor is to have a long life. The more powerful motor also creates more vibration and the 66804 will need to be bolted down to the bench-top using the holes in the base of the unit, however, it should be noted that these are of a smaller diameter than we would have liked. The Draper 29620 is a middle-of-the-range bench grinder with a 370W motor allowing it to handle some heavy duty grinding. In general, it is solidly built, the wheels are well-balanced, running smoothly with little vibration. 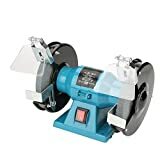 The machine comes with 36 grit and 60 grit grinding wheels, which are a little too corase for delicate blades, but as with most other bench grinders the grinding wheels can be swapped out for other types of discs if need be. The unit weighs a hefty 12 kg so it is unlikely to move much but it can be bolted down to the workbench using only two holes in the base of the unit. Overall it is a good medium-level bench grinder, however, it is let down by the inclusion of less-than-adequate tool rests which can deform when grinding something substantial, and the fixings of the tool rests and various other components on the machine, are woefully below the standard of what is otherwise a good machine. Draper is a large and well-known player in the DIY and trade professional arena producing a wide range of power and hand tools. However, with Draper, it can sometimes be a bit of a lottery as to whether you get a perfectly built tool as quality control at Draper seems to slip up once in a while and lets through some substandard units. Sometimes it is a matter of going though a couple of rounds of returning substandard items until you are satisfied with the unit you have received. The Draper 05096 bench grinder and belt sander is an excellent alternative to the straight bench grinder. It has a powerful 370W motor which allows it to grind some harder materials (like titanium), as well as run a 50 x 686mm sanding belt. It also has some excellent bonus features, including an integral worklight, a dust extraction port on the belt sander, and it even has a grinder dressing tool clipped to the top of the machine. The strong motor of the 05096 is relatively quiet and shows little vibration given its high wattage. The higher power of this Draper bench grinder also permits it to act as a reasonable polisher if the grinding wheel is replaced with a polishing or wire wheel, although like most consumer-targeted bench grinders, the wheel rotation will still slow down if too much pressure is applied. Once again as with most consumer bench grinders, the motor will heat up after 15-30 minutes of use, so it will need to be allowed to cool down at regular intervals during long working sessions. The work light that comes attached to the unit is a nice feature that many-a-budget bench grinder does not possess, however, ther light choice is a little lacking as although the light is sufficiently bright, it does not throw an even light, and it also only operates when the motor is switched on as opposed to having its own separate control switch – some minor annoyances but nothing too serious. As alluded to elsewhere, Draper is a medium-sized UK firm that is well known to the DIY consumer and trade professional for their wide range of Draper-branded tools. Build quality and quality control can sometimes be a bit hit-or-miss, but on the whole the 05096 is well-designed with reasonable build-quality. When the unit first arrives, make sure that the sanding belt alignment is true, and correct it if necessary using the appropriate tracking knob. This is important since the belt can get damaged if the motor is switched on and the belt is significantly misaligned. The Sealey BG150XLW/98 is a powerful bench grinder that comes with a grinding wheel and one wire wheel. It has a 370W motor that is strong enough to grind some of the harder metals, and it can be used for longer than budget models before it needs to be given a rest to cool down. The wire wheel is useful for removing old coatings on metal objects such as paint or rust and of course other wheels can be swapped into place of the grinding wheel or the wire wheel as needed. The unit runs smoothly, with little vibration, but it still needs to be bolted down to the workbench to ensure it does not move at all. Niggles with the Sealey bench grinder are common to most bench grinders in this price range, for instance, care still needs to be taken not to put too much pressure on the spinning wheels as this will cause them to slow down, reducing its ability to effectively grind or polish. The Sealey brand is a well-known brand in the UK as they are one of the largest equipment suppliers to the DIY consumer and the trade professional and it is not uncommon to see Sealey tools in the home garage or workshop and also in the factory. They have a reputation for procuring and selling reasonably well-built tools that are reliable but also sell at a reasonable price. The RPBG6 and RPBG8 are Record Power’s earlier contribution to the bench grinding power tool category. The RPBG6 uses the 6″ (150mm) diameter grinding wheels, while the RPBG8 runs the 8″ (200mm) diameter discs. Both machines have been discontinued by Record and replaced with more up-to-date machines, however they are still being sold on Amazon. It is not clear why they were discontinued but one guess based on user feedback is that they were not up to the build quality of the Record Power reputation. Record Power tools are usually high quality and usually with a high price tag to match, but the RPBG6 and the RPBG8 were of much lower quality than we have come to expect from Record. On the positive side, the machines house a powerful 370W (RPBG6) and 500W (RPBG8) motor that are able to tackle most grinding and polishing jobs. The bench grinders come standard with a wider fine grinding wheel, and both wheels, if properly adjusted, run true and with little vibration. This together with an extensive warranty makes the purchase of either bench grinder a compelling prospect. On the negative side, the spark guards are poorly-made, and one would expect the tool rests to be better designed on a reputable machine. In addition, the manual is poorly-written (by a native of China is our guess) which is sometimes a bad sign, and particularly ominous from a company that prides itself on living up to British standards.